The man who gave the world The Big Mac has died, aged 98. Apparently Michael “Jim” Delligatti created the iconic burger treat almost 50 years ago while he held the franchise for McDonalds in Uniontown, Pittsburgh. I’m not sure when I first got to eat a Big Mac. As far as beefburgers went, we grew up with Wimpy Bars with the sauce bottles shaped like tomatoes and the occasional trip to an American Burger Bar. But somewhere around 1973, McDonalds opened their 3,001st branch in Powis Street, Woolwich, just a few hundred yards from the gates of the Arsenal in South East London. It was a revelation in its difference and blew my little mind. (A friend demonstrates a touch of brinkmanship by having been at the official opening and meeting Ronald McDonald in all his clowny-glory). Memory tells me that the burgers served in that first year were a superior product to those served today. Is that just imagination? I think not. Word has it the Woolwich site was chosen as being in the most average town in Britain, which seems strange because the IRA bombed local shops and pubs with murderous regularity. There was a time when I defied a parental edict and hopped on a bus to Woolwich. My big day out was to have a burger at McDonalds and buy the 1974 Marvel Holiday Grab Bag Treasury Special which has never been equaled in its selection of comics. 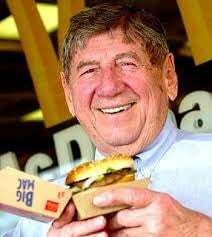 Michael "Jim" Delligatti, the man who invented the iconic Big Mac, has died aged 98.